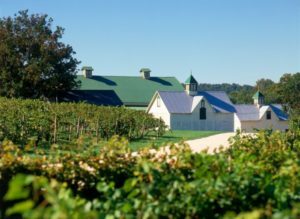 With over 70 wineries in Maryland, there are plenty of worthy destinations to pay a visit to any time of year. So, grab some close friends, hop in the car and enjoy a memorable day of sightseeing, vineyard tours, and wine tasting. Here are the 5 Maryland wine vineyards that are worth visiting in 2019. Award-winning winemaker Dave Collins has established Big Cork Vineyard as the epicenter for “BIG” flavors. Guests are invited to visit the winery and vineyard all year round. In fact, your group can drink wine inside, outside on the patios, or even from your own picnic blanket on our lawn. Additionally, vineyard tours are available at noon or 1 pm. where guests can sample a rotating list of six wines. Perhaps what sets this vineyard apart is the sleek, modern-designed tasting room with low-slung lights and a 25-foot tasting bar. 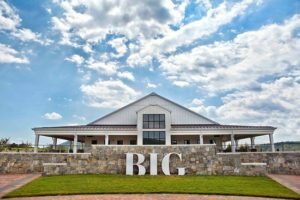 Upon entry, you’ll see why Big Cork is one of the top Maryland wine vineyards. Operating by the motto, “We work like crazy so our guests can be lazy.”, Layton’s Chance Vineyard and Winery are intent on living its values. Located just a few miles from historic downtown Vienna, MD, Layton features a variety of great wines, over 14 acres of beautiful vineyards, a large picnic area with outdoor games, and a nature trail. While you’re here, take part in a free vineyard and winery tour, Saturday and Sundays at 1 pm and 3 pm or by reservation Monday- Friday. Notably, guests will get a glimpse of the modern production area where they can learn about different winemaking techniques. Or, feel free to listen to live music during Happy Hours on Friday nights. This month’s wine is Rise Up Red! The state’s oldest winery, Boordy Vineyards, is among the most impressive vineyards in the state. Located on a rolling hill in Baltimore County, the vineyard is full of sprawling sights, rustic buildings, and beautiful grounds. And, you wouldn’t know it while emersed in a country-inspired environment, but it’s just 25 minutes from the Inner Harbor in Baltimore. But, what stands out most about Boordy is the award-winning wines and a beautiful gift shop inside of a 19th-century barn. Guests can also take a stroll around the vineyard, learn about the wine-making process, and even take a peek inside the wine-storage room. In fact, tours are offered year-round daily at 2 and 3:30 pm. Additionally, guests can delight in the tasting room, open Monday through Saturday 10 am- 5 pm and Sunday from 1 pm- 5 pm. Overall, you’re sure to find something special in Boordy’s collection of reds, whites, dry or sweet wines. In 2003, Ed Boyce and Sarah O’Herron planted the first grapes of Black Ankle Vineyard on Black Ankle Road. Subsequently, to Ed and Sarah, the name is an ode to the generations of traditional winegrowers who have come before them. Since the beginning, every grape for every bottle of wine that they produce is grown on their 142-acre farm. Come taste for yourself in a unique strawbale tasting room at a bar top made of crushed grape vines, open in mid-April. Or, enjoy a glass of wine at tables or couches outside underneath an airy tent or around a campfire. Uniquely, the tasting room and winery are built from straw, clay, stone, and wood from the farm itself. Further, guided walking tours are available on Saturdays and Sundays, at 1 pm and 3 pm. Rounding out our list of must-see Maryland wine vineyards is Running Hare Vineyard in Prince Frederick. Just a short drive from D.C., indulge in a little bit of Tuscany and Napa right in the heart of Southern Maryland. Since opening in 2008, Running Hare has produced over 100,000 bottles of wine to date. So, pack a picnic and bring your family and friends for a vineyard tour, available during select times throughout the year. Or, grab a group and go for a tasting on Saturdays, from noon to 6 pm. Guests are given 5 beautifully smooth and balanced wines to choose from. Interestingly, in 2015, Running Hare became the first farm/winery in Maryland to open a craft beer garden in the vineyard. All year round, guests can enjoy Calvert Brewing Company craft beer as well as wine. Not to mention, live music plays on select weekends in the Outdoor Tasting area. Don’t miss out on this one! Not able to make a road trip? Pick up a few bottles of wine from Festival Wine & Spirits. From well-known wineries to small family-owned vineyards, we work hard to bring you only the highest quality wines. And, make sure to check out our monthly wine tastings while you’re at it. 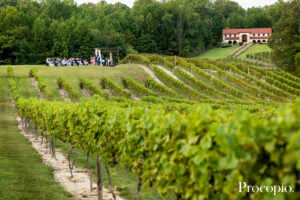 What are your top picks for Maryland wine vineyards?